I’ve been up north for the last 10 days. Not in well-to-do Muskoka, but in the Almaguin Heights region, at my small cottage on a beautiful little lake outside of Burk’s Falls, Ontario. 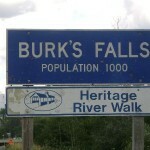 Burk’s Falls is a small, quirky Northern town and as far as I can remember, the population has been exactly 1000. That, or they just don’t change the sign. Life is slow there, but slow in a good way. The movie theatre is only open for one viewing a night, plays one movie only and is closed during the winter. It’s got a Home Hardware, one chip truck, one restaurant and the first stop light was installed last year! It’s not a cottage town – it’s a town that would exist whether the cottagers on the lake came in or not. One day, on my vacation away from the internet, I went into the local store to buy shampoo. I perused the toiletry isle, searching for neat shampoo. I wanted something like organic-lake-friendly shampoo, or artsy-handcrafted-lavender shampoo, or even my all time favourite over-processed shampoo – Brilliant Brunette. I was willing to drop at least $20 of my $35 to treat myself – I’m on vacation!!! 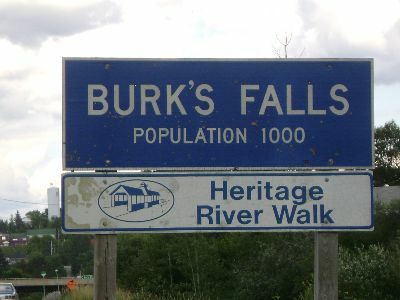 However, since Burk’s Falls is not a cottage town that caters to well-to-do Muskoka visitors, I didn’t find any. In fact, they only had three bottles of Pert Plus. Pert Plus – two-in-one shampoo/conditioner in a shiny green bottle. Shannon looks confused. Searches behind the three bottles and shakes her head. Really? That’s it? I wonder if they have something else in stock. Shannon trots up to the counter to Rhonda, the long-time store owner in her mid fifties. A pretty woman, but one that could probably hog-tie a cow in 7 seconds or less and win at the Calgary Stampede. Oh hi there, I was just wondering if there was any other shampoo besides the Pert Plus? Rhonda smacks her gums and looks Shannon up and down. Eyes her hipster-onesy (bought on Shannon’s ridiculous shopping spree), and decides that Shannon is definitely not from around here. What’s wrong with Pert Plus? I was definitely annoyingly cheerful. I was just, ah- looking for separate shampoo and conditioner? Please don’t hog tie me. It’s two-in-one. Aren’t you city folk all about efficiency? Shannon gets Pert Plus, pays for it, gives Rhonda an awkwardly large smile and leaves to avoid a hog-tie. As I walked out of the store, into my nice rental car, with my three pairs of sunglasses and my ipod hooked up I immediately couldn’t help but smile. Rhonda is so right – what the hell is wrong with Pert Plus? What the hell is wrong with me? Am I spoiled? Probably. But here, in Burk’s Falls, the general thought is – why do you need anything else? I needed shampoo and I got it – so why didn’t I feel the same resentment here that I feel when I’m in Toronto and I have to settle on the “cheaper version” or the lesser-quality item or go without. Being original, having quality stuff and – without sounding cliché- “having more” are measures of success that seems to perpetuate from the city – where people have the money to buy more, to pay for quality and to constantly be hip. I think this is why so many “average” earners in the city struggle to strike the balance between what they have, a fair wage, and what they want – the rich person’s wage. I know I struggled, even when I had a great income. Up north – no one has it all. You don’t see that woman walking down the street in that perfect outfit, or hear about cool parties and galas that others get to go to. No one is renovating their kitchen just because it “needs a little lift”. There is a lot less competition with your neighbour and the standard of success is easier to live up to. It’s not that my $35/week would last me longer in the north, it’s that I just wouldn’t be constantly reminded that I can’t keep up with everyone else when I opt for the cheaper brand. Without all the expensive options and social pressures of other people spending a lot of money like in the Big Smoke, I imagine it would be a nice break. I’m sure money problems exist, but I’d venture to say they tend to manifest themselves in different ways than in the city – less keeping up with the Jones. So next time you’re feeling inadequate because you can’t afford something, or you’re having that debate with yourself about whether to purchase it anyways on credit, try to figure out who your Mr. or Mrs. Jones is. We should all try to be conscious about who we are trying to impress, even if it’s just ourselves. I’ll tell you one thing, the Jones are richer in Toronto and much much harder to keep up with. I absolutely love this post. It is so true! I have noticed a complete difference in my attitude towards clothes, possessions, even necessities since I moved into the city. Nothing seems as easy here as it does in the small town glory I am used to. No name products, the wrong clothes, etc seem ‘unacceptable’ here. Like you’ve said before…somewhere all of us secretly care about what other people think. Wave your Pert Plus with pride lady! It does the job and now your $35/week is in fine form!